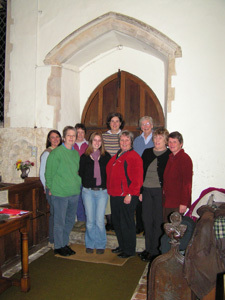 Soon after the tsunami devastated parts of Indonesia in December 2004, a group of over 100 people in Suffolk, England got together to make teddy bears to be sent to the children orphaned by the disaster. The lady who had the idea and organized the whole project is Jenny Schurr, and she was able to coordinate among this group to collect together over 1000 teddies. Unfortunately there were difficulties finding a charity prepared to receive and distribute the teddies, and for over 2 years Jenny struggled to find one who would, without success. 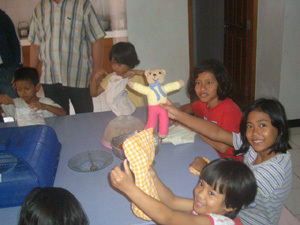 Towards the end of 2006 Jenny came into contact with Yayasan Gunungan. Although the Foundation is based in Indonesia , the location of the Foundation is in the middle of the island of Java . This is too far from the tsunami affected area of Aceh, at the far west of the island of Sumatra , to be able to distribute the Teddies there. Instead the Foundation offered to distribute the teddies to orphanages and under-privileged children within the local area. So in November 2006, Crayford Freight Services Ltd in UK generously arranged for the teddies to be sent to Indonesia without charge. Unfortunately, after arriving in Indonesia , it took months to navigate the teddies through the lengthy Indonesian beurocrocy. At last, in March 2007, the Teddies eventually arrived at the Foundation's door, some 4 months after they had set sail from England . The Foundation then set about the task of finding homes for them all�. 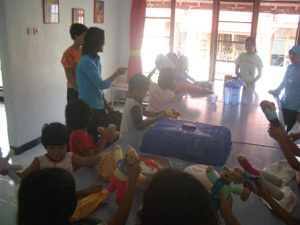 The first distribution was at a place called Aulia in Yogyakarta. This organization works in co-ordination with their sister foundation in Jakarta , which operates in the slums of the capital city. The sister foundation currently sponsors approximately 1,400 children from the slums to go to school, and where they find children and babies which are neglected or unwanted then they arrange for them to be brought to Aulia. Aulia specializes in receiving and giving a home to young children and babies from the slums of Jakarta , especially young girls who would otherwise most likely enter a life of prostitution and drugs. The second distribution was at a place called Sayap Ibu also in Yogyakarta. This is another independent organization, which takes in unwanted babies in the local area. Many of these babies are from young girls or prostitutes who have tried unsuccessfully to terminate their pregnancy. As a result many of the babies are physically and/or mentally disabled to differing degrees. The children stay at Sayap Ibu until they are either adopted or reach the age of 5, at which time a new home has to be found for them. On behalf of all these children, and also for giving us the opportunity to hand the teddies out, very many thanks and best wishes to Jenny and all the Knitters.